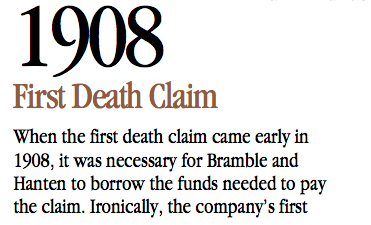 When the first death claim came early in 1908, it was necessary for Frank Bramble and John Hanten to borrow the funds needed to pay the claim. Ironically, the company's first recorded death claim was on the life of Nettie Smith, wife of the company's original secretary-treasurer Fred Smith. She died of appendicitis at the age of 38. Compared to today, risk of death was higher in the early 1900's. Many people died from a variety of infections and illnesses that seem minor or unknown today. To read all the posts about Frank L. Bramble, click here. To read all the posts about John Hanten, click here. To read all the posts about Fred Smith, click here.